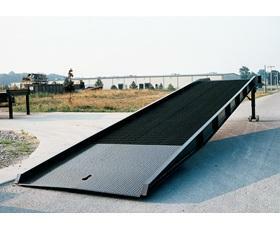 Yard Ramps provide flexibility with ground-level loading. Reduces material handling costs, expedite loading and utilize dock mobility. Unit is easy to operate with a manual hand crank system with a service range of 45-62". Standard features include: maximum traction steel grating, safety locking chains, 9" steel wheels, 4" high safety curbs and rubber bumpers. Optional features include: pneumatic tires, hand pump hydraulic or DC lift, fork lift pickup slots, tow bar loop, tow bar hitch and handrails. Aluminum yard ramps also available. FOB Shipping Point. Most standard items by Vestil Manufacturing, are in stock and ready for immediate shipment. Custom orders are our specialty and fabrication services are available on most items. Call 800-757-1064 for pricing, availability and quantity discounts. 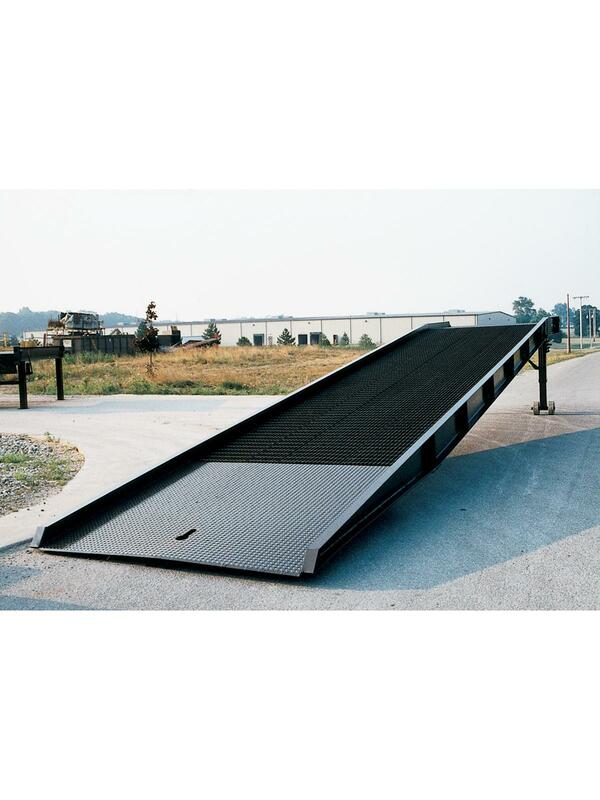 Click here to see more Loading Dock Equipment! 36' L. ramps include 30' of ramping and a 6' level off. Other sizes and capacities available. Nationwide Industrial Supply is a preferred global distributor for Vestil Mfg.